This super MOIST and tasty (veggie filled) corn bread starts out with two of those little Jiffy corn bread mixes (what could be easier?) and feeds a crowd. It is equally delicious warm or at room temperature, so it is perfect for a pot luck or holiday brunch. Saute broccoli, corn and onion until tender, set aside. In large bowl, beat 4 eggs together and stir in melted butter, cottage cheese and pepper flakes. Add Jiffy mixes and stir until smooth. Gently stir in broccoli, corn and onion. Spread in a greased 9 x 13 baking dish and bake (375°) for 35 to 40 minutes or until lightly browned. NOTE: Finely diced sweet red pepper is pretty in this cornbread too, but I was out of it. This looks fantastic-in fact I had cornbread with broccoli in it a few months ago at a brunch I went to. It was so moist and delicious, but I forgot to ask for the recipe, so thanks for posting this. 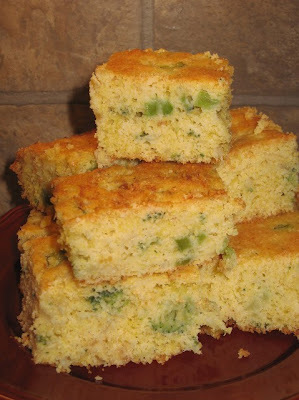 This looks wonderful Coleen..I love cornbread! Hello, Just a little heads up, if using Jiffy cornbread mix, it will not be vegetarian. Jiffy uses lard in their products. If you do not care about it being vegetarian and just want more veggies in your cornbread then all is good.